Indoor Cats live longer. Bringing Your Outdoor Cat Inside. Indoor Cats Live Longer. Bringing Your Outdoor Cat Inside Can Work. Most indoor cats enjoy going outside. And it's understandable. After all, the great outdoors is exciting! There are interesting smells, all kind of things to hunt and strange cats to meet! As appealing as being outdoors may seem to your kitty, the dangers to any cat alone outdoors are far greater than most people know. The best way to protect outdoor cats is by bringing them inside, for good. This is all about the health and safety of a pet you love and want to protect. A cherished indoor cat is protected, but every time your cat leaves the safety of your home, he is taking on all the same risks as any outdoor cat. You have no control over who or what might mistreat him, or what kinds of diseases or toxins he might encounter. Could be he'll catch a rat that has been poisoned, or encounter the neighborhood "cat-chomping dog"! Extreme examples? Maybe, but the fact is you have no way of protecting your indoor cat once he’s out of your realm. The shocking and sad truth is this; the average lifespan of outdoor cats is usually no more than five years. Compare that with well cared for indoor cats, which can live fifteen to twenty years! It's so sad that feral and stray cats have so many dangers to face every day! And it’s just as sad that so many well intentioned cat owners let their indoor cats roam outside, to be at risk of facing those same dangers! It's not something most cat lovers just stand around and talk about, but it is important that responsible cat owners become more aware of all the threats their own indoor cats may face when they are allowed to roam free. Below, I've listed some of the dangers that any cat outdoors may encounter. Automobiles - We've all seen or heard about the horrors of Cat vs. Car - enough said. Other Cats - Most outdoor cats are territorial by necessity and will fight to protect what they consider to be theirs. 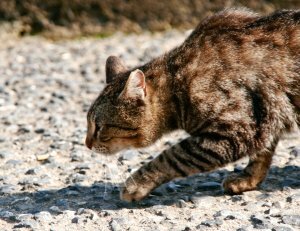 Your indoor cat is not territorial out there and may not know he is "trespassing" until he is attacked by another (possibly diseased) cat. And, even if no disease is present, cat fights can result in cuts, scratches or worse for your cat. Disease - There are many diseases like Feline Leukemia, Rabies and Immunodeficiency Viruses which can be transmitted from one animal to another. Your indoor cat can easily contract rabies or worse from being outside. Also, wild animals can attack your cat, and even if it's lucky enough to survive unharmed, your pet may catch any number of creepy crawlies from wildlife! as well as plant and garden fertilizers. Automotive antifreeze is sweet tasting, and even something as innocent as crunching on some dry leaves can be fatal, depending on the species - for instance, apple leaves contain cyanide, and lilies are toxic in all forms. 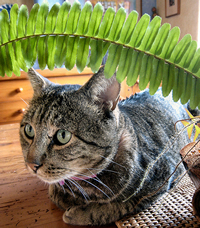 There are many Cat Toxic Plants that are very common gardener's favorites. People - It's sad to say, but unfortunately true - there are some sick people in the world who are just plain mean to animals. In fact, some people, juveniles as well as adults, abuse and torture animals. While most of the people in your neighborhood are probably kind, are you willing to risk your indoor cat falling into the clutches of the one person or worse, gang that hates cats? Crawly Critters! 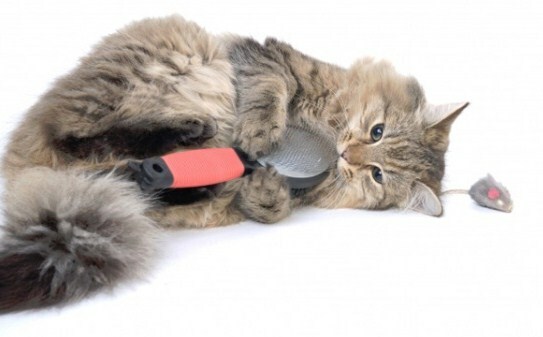 - If yours is an exclusively indoor cat , he is a lot less likely to become infested with fleas, ticks and mites. At least in your home, you control the environment, and if you keep your home free of these pests, your cat will be too! If your indoor cat hangs around with outdoor cats, he will probably bring some of these pests in with him when he comes home. Little Lost Souls - When cats roam outside, it's not uncommon for them to wind up getting lost or picked up by animal control. If your cat does not have the proper identification, it might be hard to locate him. Even if he had a collar and tags when he left home, those often become lost when a cat climbs a tree or scoots under a fence. Thieves - You think your cat is wonderful. Well, others may think the same thing, and if your indoor cat goes outside and encounters another "admirer" , there is a chance your cat could be stolen. Dogs - Whether a tame pet or stray dog, canines that come across outdoor cats are not always nice, and if your indoor cat isn't aware of that, he could walk right into the jaws of an enemy. All the things I've listed above are good solid reasons for a responsible cat owner to keep their felines as exclusively indoor cats. But we worry about our furry kids and want them to be happy, as well as safe. But there are lots of things you can do to make sure your cat is happy inside your home. Make sure you have lots of toys for your cat to play with! Indoor cats that don't get enough stimulation often become overweight and spend a lot of their time sleeping. Of course, all felines, indoor and otherwise, are known for taking nice long naps, so don't worry if your kitty sleeps a lot. It's just that you want him to have lots of fun things to do when he's awake. It's imperative that kitty has lots of fun cat toys to play with. Also, rotate them by keeping about half of them stored in a plastic container full of catnip. That way when you make the exchange, the ones that have been in storage seem like brand new toys and catch your cat's interest all over again! It is also a good idea if you can try to spend 20 to 60 minutes a day actually playing with your cat. A newly transitioned indoor cat has become accustomed to making his own fun, but with just a tiny bit of effort and time, you can get to know your newly assimilated house cat in a whole new light, and grow even closer with your feline pal. Bear in mind that even though 20 to 60 minutes might seem like a long time, you can watch TV or sip your coffee or tea while playing with your cat and it's a great way to wake up in the morning or wind down at night. Cats are most active at twilight and early morning hours, so it's not hard to work playtime into your routine and the time spent will strengthen the bond between you and your feline friend. Another important thing to invest in is a cat tree, scratching post or condo . Cat furniture allows your cat to have his very own hide out, high above the rest of the room. This serves as a sleep station, look out and even a stalking and pouncing point, all of which are very important to house cats. Cats not only enjoy the fun scratching opportunities that cat trees provide, they actually need to scratch. If possible, put the cat tree near a window. If given the opportunity, many felines will happily watch what's going on outside for hours. A window perch is such a nice place for your cat, and an affordable interim step till you can find a cat tree you like. Another thing you might consider is to get a second cat! There are many wonderful cats sitting in shelters just waiting to find their forever home, and contrary to what people may say, cats are really not loners, in fact most of them enjoy companionship! 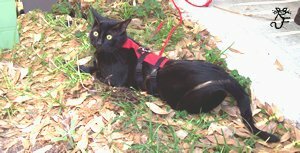 Finally, if you feel bad about your cat not being allowed to go outside then buy him a good cat harness (not just a collar, because they can slip right out of even the best of them) and take him for a walk! Not all cats enjoy going for walks…but you'll never know until you try! Sometimes they just like to sit outside with you and munch the grass. For your cat's health and safety, and for you to have a long and happy life together, I wish you much success transitioning your outdoor cat…into an indoor cat! Do you have questions on this or another subject? Please feel free to send me your questions and I will help in any way I can. Do You Have a Question For The Cat Lady? 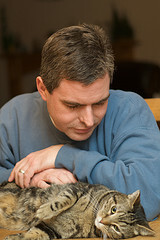 Do you have a question concerning cats or cat care? Ask The Cat Lady! Your question may appear on a Web page exactly the way you enter it here. You can wrap a word in square brackets to make it appear bold. For example [my story] would show as my story on the Web page containing your question. TIP: Since most people scan Web pages, include your main question in your first paragraph.